Question: I have the time and money for just one trip this year, and I’ve decided to try saltwater fly fishing for the first time. Where should I go? Answer: As far as I’m concerned, this one’s a no-brainer: go to the Bahamas for bonefish. There are several reasons these Atlantic islands are the best place to start your saltwater angling career. Bahamians speak English and are very accustomed to hosting Americans. This is not to suggest that destinations in Central or South America aren’t as welcoming—most are—but if you’re on your very first International fly-fishing trip, it will help if there’s no communication gap between you and your guide. The Bahamas are only 50 miles off the coast of Florida, so traveling to the islands is extremely easy. The less travel-related stress, the more you can focus on fishing. Bonefish should be your first saltwater fish. Casting for bones offers everything that makes saltwater angling so exciting. You’re casting to fish you can see, you have to make a pretty good presentation, you can watch the fish eat (or not), and once hooked they make reel-screaming runs. There are bigger species, such as tarpon, and more difficult species, such as permit, but bonefish are more forgiving for beginning anglers. Bahamian bonefish are plentiful and stupid. Unlike the well-educated bonefish in the Keys, Bahamian bones are not nearly as finicky or wary. You won’t need to cast 90 feet to catch a bonefish in the Bahamas, and if things get really tough, you can usually find schools of “mudding” fish that are eager to put a bend in your rod. If you’re starting on a long fascination with saltwater species, it’s good to start on a successful trip. Sight-fishing is a blast, and no other combination of species and destination offers you so many shots at fish. While you’re chasing bones, you can also get shots at barracuda, permit, or even tarpon. The Bahamas offers every kind of lodge. 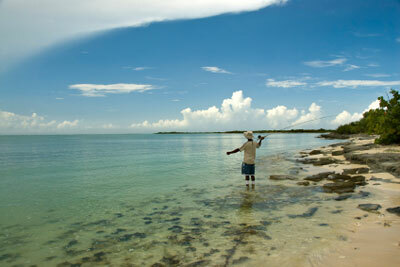 There are dozens of bonefish lodges in the Bahamas, and they range wildly in amenities, location, and available water. Want to be close to civilization or way out in the boonies? Want to be surrounded by lots of other anglers or have a more intimate experience? Are you looking for huge numbers of fish or just really big ones? Do a little bit of research, and you can find an operation that fits your needs, your skill level, and your budget. Given all this, don’t forget to do your homework to make sure you get exactly what you’re looking for. Check out my previous column on booking a fly-fishing trip for planning tips.